In 1949, there was a famous experiment in which students were asked to name a series of playing cards as the experimenters flipped them face-up. Some of the cards had been doctored—for example, there was a red six of spades (instead of the usual black card). When experimenters showed the cards quickly, students misread the cards; when they showed the cards more slowly, students were more likely to recognize their mistakes. The experiment proved to be an important influence on the thinking of the great science historian Thomas Kuhn. Kuhn argued that, throughout history, human beings are forced to adapt to changing environments. At first, they try to respond to their new environment using the same strategies and coping mechanisms they’ve already learned. But eventually, humans learn new strategies for living in their new environment—in brief, a new “paradigm” for survival. Kolbert introduces the ideas of Thomas Kuhn, the science historian who first proposed the concept of the “paradigm shift.” Although Kolbert’s book is about the history of mass-extinction, it’s also about the scientific process in general. Kuhn’s work is an important tool for analyzing the different ways that scientists have conceived of mass-extinction in the last 250 years: again and again, a controversial scientist will introduce a new idea, or paradigm, and the paradigm will gradually become an accepted part of the scientific community. Kuhn’s ideas about paradigms and “paradigm shifts” are a good lens through which to study the history of evolutionary science. Leading up to every major biological discovery, there is an awkward transition period, in which scientists try to explain new phenomena using old rules. For example, when scientists studied the first fossils, they tried to argue that these fossils belonged to living species; it took Cuvier to introduce the new paradigm: some animals go extinct. The same is true of uniformitarianism: for a century, scientists tried to explain the “gap” in fossil layers by citing the old paradigm that species gradually go extinct. It took the Alvarezes, with their theory of an asteroid that wiped out the dinosaurs, to introduce the new paradigm of mass-extinction. Today, most scientists believe that species usually go extinct gradually, except when there’s a sudden, catastrophic event, in which case many species go extinct very quickly. Kolbert applies Kuhn’s ideas to some of the science history she discussed in the previous chapters. Over time, scientific understanding of extinction has gone through a series of new paradigms, such as uniformitarianism, catastrophism, and the contemporary, hybrid paradigm of uniformitarianism- catastrophism. Over time, Kolbert seems to believe, the science of extinction has become more accurate; however, Kuhn’s theories would imply that a new, more accurate paradigm of extinction science might come along in the future. Kolbert travels to a cliff called Dob’s Linn, located in the Scottish Highlands. There, she meets with a stratigrapher (a scientist who studies the different eras of planetary history) named Jan Zalasiewicz, who shows her layers of rock dating back 445 million years to the era immediately following the extinction of the dinosaurs. During this era, the Ordovician era, sea life grew rapidly and the first coral reefs were formed. Midway through the Ordovician era, moss-like plants appeared on land. But at the end of the era, almost all the life in the oceans—perhaps 85 percent—went extinct. By interviewing Zalasiewicz, Kolbert picks up where she left off in the previous chapter: after the extinction of the dinosaurs some forms of life, including coral and moss, survived and flourished. But the extinction of the dinosaurs was not the only mass-extinction in global history—there were other, more recent mass-extinctions that eliminated the vast majority of life on Earth. This reinforces the catastrophism-gradualism paradigm, in which gradualist periods are interrupted by catastrophic events. Zalasiewicz’s specialty is the graptolite—a kind of marine animal that lived in a large colony of tubular shells. Graptolites used to be some of the most common creatures in the ocean; their long, thin, V-shaped bodies were strong and resilient to changes in temperature and pressure. Around 444 million years ago, something must have happened to make the graptolites’ V-shaped bodies an evolutionary disadvantage. Kolbert continues to use Darwin’s ideas to analyze mass-extinction. For example, she writes about the graptolite’s useful evolutionary traits, such as its strong, V-shaped body. The natural question raised by this is why the graptolite’s evolutionary advantages became disadvantages. After the Alvarezes published their paper on the asteroid that wiped out the dinosaurs, scientists slowly began to rethink their ideas about extinction. If an asteroid could explain one “fossil gap,” perhaps other catastrophes could explain other fossil gaps. Some scientists argued that the periodic gaps in the fossil record could be explained by the presence of a small “companion star” that periodically showered comets on the Earth’s surface, destroying almost all life. However, scientists haven’t been able to back up this thesis with much empirical evidence. Like Cuvier and Darwin, the Alvarezes influence on science extended far beyond the original scope of their project. Inspired by the Alvarezes theory of mass-extinction, other scientists argued that the extinction of the dinosaurs wasn’t at all unique; there were many other mass-extinctions in the Earth’s history. As Kolbert admits, there is relatively little evidence to explain the other mass-extinctions in the Earth’s history—extinction is such a new scientific concept that scientists will have to gather a lot more evidence before they can develop satisfactory theories of mass-extinction. At the moment, the most common theory of the mass-extinction that took place at the end of the Ordovician era is that glaciation killed many species. Around this time, carbon dioxide levels in the atmosphere dropped, causing temperatures to fall. Sea levels went down, wreaking havoc on marine life. While it’s not clear why carbon dioxide levels went down so quickly, there’s some evidence to suggest that the mossy plants that had appeared on land earlier in the Ordovician era drew the carbon dioxide out of the atmosphere—meaning that, in short, the mass-extinction of marine animals was caused by plants. Kolbert acknowledges openly that scientists aren’t particularly confident in their theory of the Ordovician mass-extinction; however, the most likely theory at the moment is that plants consumed too much of the Earth’s carbon dioxide. The uncertainty surrounding the Ordovician extinction should alert readers to the possibility of the eventual emergence of a radical new theory that better explains this period. However, Kolbert is comfortable giving readers the most complete theory that currently exists with appropriate disclaimers. Scientists have also argued that there was a mass-extinction about 252 million years ago, caused by a sudden increase in carbon dioxide levels in the atmosphere. The average ocean temperature went up by some 18 degrees, water became more acidic, and the amount of oxygen in the water decreased, suffocating many species. As a result, about ninety percent of the world’s species went extinct. It’s likely that the increases in temperature also triggered the growth of poisonous bacteria, accelerating the extinction process. In general, it appears that each mass-extinction is a little different than the one before it. There is no general theory of mass-extinction; instead, there are multiple ways for many species to go extinct simultaneously. Although each mass extinction is unique, Kolbert’s description of the mass-extinction that took place 252 million years ago parallels her discussion of the current Sixth Extinction: then and now, the carbon dioxide concentration of the atmosphere increased, threatening the many different life forms that rely on oxygen to survive. The point that mass-extinctions are all different is an important one, because it stresses that periods of mass-extinction are defined by what happens to species, rather than the specific nature of environmental change. This means that the current period, though distinct in its specifics from all other mass-extinctions, should still be considered a mass-extinction. During Kolbert’s time in Scotland, she learned about Zalasiewicz’s theory of giant rats. In the future, Zalasiewicz argues, rats will take over the planet; they’ll reproduce, growing larger and more powerful. While such an idea seems implausible, it’s undeniable that humans have rearranged the world’s ecosystems, and wherever humans go, rats follow—for example, when European explorers sailed to Australia, China, and South America, rats snuck aboard their ships, and adapted to their new homes. The result is that rats are among the most resilient creatures on the planet, and it’s likely that, in the event of a mass-extinction, rats will survive. The implication of this passage is that, at some point in the future, human beings will go extinct, due to the changing composition of the Earth’s atmosphere (changes that humans played a major role in causing). Zalasiewicz’s rat theory relies on the idea of “preservation potential,” which suggests that rats (because of their ubiquity across the globe) would be capable of surviving calamity. However, readers should be a little skeptical of this, considering that other species with high preservation potential (like the ammonite) have gone extinct. The premise of Zalasiewicz’s theory of giant rats is that humans have ushered in a new era of mass-extinction. The most popular term for the “age of humans” is Anthropocene. Paul Crutzen, the scientist who coined the term in 2000, argued that humans have fundamentally changed their planet in several ways: 1) humans have majorly transformed almost half of the world’s land surface; 2) humans have either damned or diverted the majority of the world’s rivers; 3) human agriculture has dramatically increased the amount of nitrogen in the atmosphere; 4) humans have eliminated more than a third of the primary marine life of oceans’ coastal waters; 5) humans consume more than half of the world’s available fresh water; 6) humans have dramatically changed the composition of the Earth’s atmosphere by releasing carbon dioxide and methane gas. On the basis of these six points, Crutzen argued that humans have brought about a new epoch in the Earth’s history. Moreover, Crutzen argued that the result of these manmade changes in the environment will be a new mass-extinction. In this important passage, Kolbert lays out the case that human beings have altered their planet in important, fundamental ways. A further implication of Crutzen’s Anthropocene theory is that human beings’ defining characteristic—the essence of human nature—is their ability to change their environments. Notice that Crutzen developed his ideas about the Anthropocene very recently—for most of the history of science, human beings weren’t fully aware of how greatly they could shape their own planet. Now, by contrast, it is human activity that, perhaps, defines this geological era on Earth. Crutzen’s ideas about the Anthropocene—and, indeed, the idea that humans are capable of fundamentally altering the planet—are so recent that many people don’t believe them at all. Figures like Zalasiewicz (and Kolbert, too) play an important role in introducing the new paradigm to the public. Arn, Jackson. 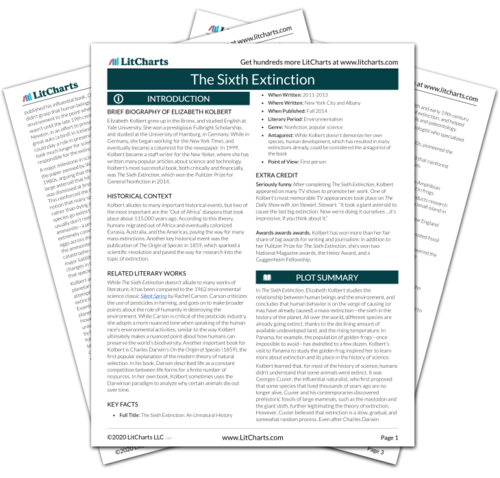 "The Sixth Extinction Chapter 5: Welcome to the Anthropocene." LitCharts. LitCharts LLC, 22 Jun 2017. Web. 19 Apr 2019. Arn, Jackson. "The Sixth Extinction Chapter 5: Welcome to the Anthropocene." LitCharts LLC, June 22, 2017. 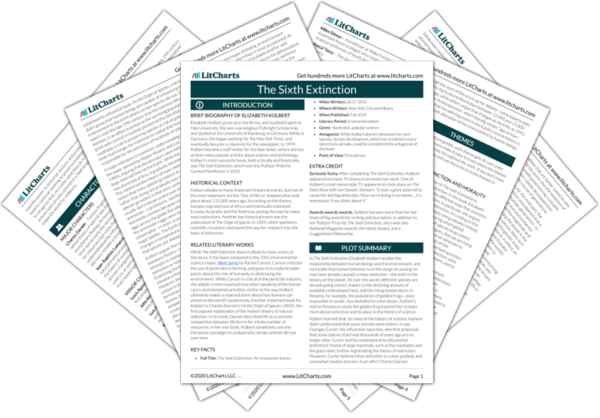 Retrieved April 19, 2019. https://www.litcharts.com/lit/the-sixth-extinction/chapter-5-welcome-to-the-anthropocene.